WinterBuddy is a project I was doing for Bossland GmbH. The main part of the work was reversing the games script engine. This allowed for interaction with the game on engine level and working on engine level it was easy to access different elements the game offers. 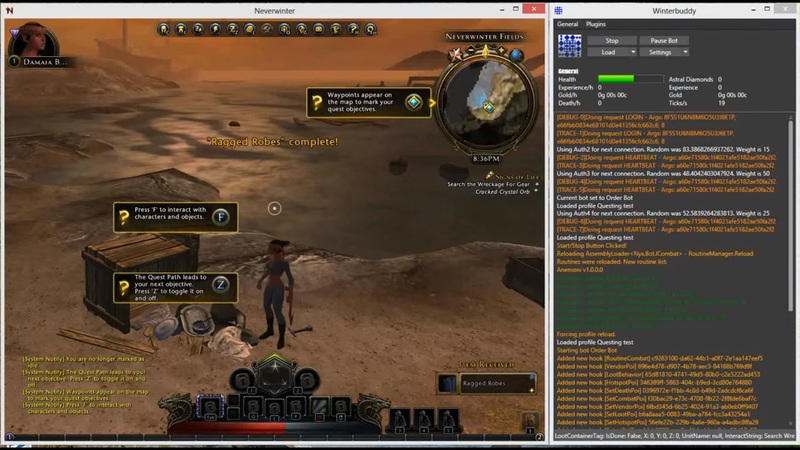 The bot was able to handle NPC Interaction, questing, combat and navigation. For navigation multiple options where available. Since the game already offered some sort of A* implementation for it’s golden trail, a visual marker for the player to follow to his next quest, an implementation that could handle the in game available data structure and do the path planing accordingly. The second option was to reverse the data layer of the game and feed them into Recast & Detour. Since I’m a friend of quick results the option of using the in game data was used. Dealing with a commercial focused operation there simply is no room for products that don’t sell. It doesn’t depend why there where no sales. Maybe the product was not mature enough for the market or the market simply didn’t need a tool like that. In the end the product was discontinued due to not being a commercial success. When you’re looking for ways to automate game play of different games make sure to check out The Buddy Forum. You will find what you’re looking for and finally the available bots offer great quality and amazing support. When you want to know more about one of their bots ask in the Buddy Forum. Their support team will be very happy to help you with all your inquiries and assist you with all your issues regarding their software. I had a great time working on this project, the team was amazing and I acquired a lot of knowledge about IDA Pro and software reverse engineering in general. But finally take a look at the result of the hard work.